On July 4, 1915 Filipino cannery workers at the Alaska Packers Association’s Larsen Bay salmon cannery orchestrated a parade and pageant, the likes of which the west side of Kodiak Island had never witnessed. Drummers and guitar players led the parade down the pier. Alder branches and flags were attached to fish carts, turning the carts into parade floats. Within the carts were costumed men. One was dressed as Uncle Sam, another as an American Indian. Acrobats balanced in a human pyramid while workers dressed as policemen looked on. This day is recorded in a photograph collection at the University of Alaska Fairbanks. These are the earliest known photographs of Filipinos in Kodiak. Filipinos today are the largest minority on Kodiak Island. This remarkable photo collection provides a glimpse of how two peripheries of American imperialism—Alaska and the Philippines—came together in canneries at the turn of the 20th century, and an opportunity to trace Filipino participation in the Pacific seafood industry. Paul Lewis and Diane Rodill pose in front of the Larsen Bay cannery on the Fourth of July, 2015. Diane's father, Denis, was one of the Alaskeros who took part in the 1915 parade and pageant. Diane and her husband, Paul, traveled to Larsen Bay in honor of the 100 year anniversary of Diane's father working in Larsen Bay. Filipinos have been a mainstay of the seafood industry for a century. Before that, “Manila men” were on many early Western voyages to Alaska. But it took two events to prompt Filipinos to begin working in Alaska’s seafood industry-- the 1882 Chinese Exclusion Act and the Spanish-American War. With the Chinese Exclusion Act, Congress prohibited Chinese from immigrating to the US. White nativists felt Chinese workers were taking white jobs and threatening their perception of white American identity. These sentiments coincided with an economic depression and a nation-wide debate about “wage slavery” in post-emancipation America. It also coincided with the beginning of the canned salmon industry. Chinese were skilled tinsmiths. Chinese workers did the grunt work that most white Americans avoided, such as butchering salmon and filling cans on the North Pacific’s most remote shorelines. It was on the labor of these Chinese cannery hands that much of the Pacific salmon industry was based, but due to the Chinese Exclusion Act, there weren’t young Chinese recruits to replace the aging workforce. Japanese workers, too, became important cannery employees, but in 1907 the US and Japan ended Japanese immigration to the US. It was at this time that the first trickle of Filipinos sailed for west coast ports. These Filipinos were American nationals, since the Philippines became a US possession following the US’s victory in the 1898 Spanish-American War. Filipinos switched from being subjects of Spanish colonization to American nationals, gaining American passports. As nationals, Filipinos could travel to the US and live and work here, but that was all. They weren’t able to vote, purchase property, marry white women, or a host of other rights associated with citizenship. But work they did, nearly exclusively in low paying jobs. Many became migrant workers, shifting from farm work to salmon work from one season to the next. These Filipino men had received American-style educations back in the Philippines, often under the tutelage of American teachers. For many, it came as a shock that the American values they had learned about were not evident when they arrived on the continent’s shores. “America came to us with bright-winged promises of liberty, equality, fraternity. What has become of them?” wrote Filipino immigrant Manuel Buaken. For Filipino cannery workers, Chinese exclusion granted them the opportunity to enter the Alaska seafood industry since Chinese cannery hands became too old to continue the physically taxing work. Nonetheless, the anti-Asian rhetoric used to muster exclusionary immigration policies also worked to shut the door on Filipinos’ chances of becoming American citizens. The Filipinos who paraded down the Larsen Bay pier on the Fourth of July in 1915 passed Alutiiq spectators. Like the Filipinos with whom they interacted in Larsen Bay, Alutiiq people, too, were subjects of American colonialism with few political rights. These Alutiiq onlookers were not granted American citizenship until 1924. The Filipinos who worked in Larsen Bay in 1915 represent the earliest wave of Filipino immigrants to the US, following the Spanish-American War. Perhaps the patriotic pageant that they executed on the cannery’s boardwalks was a way to prove their knowledge of American customs, history, and values and, at least for a day, take part in reenacting the American dream. To learn more about the early history of Filipino cannery workers--- and hear from the daughter of one of the men who paraded in 1915--- visit http://kmxt.org/2014/10/way-back-in-kodiak-filipinos-in-larsen-bay-1915/. Through late May and early June of 1940, a motley fleet of 850 recreational, commercial, and fishing boats sailed from England to Dunkirk, France to evacuate 338,000 Allied troops. The “little ships of Dunkirk” had a shallow draft which allowed the vessels to get close enough to shore to retrieve troops without the use of docks. Some of these vessels ferried troops to destroyers that waited further off-shore, while others sailed troops to England. This privately owned auxiliary fleet helped salvage one of Britain’s largest-ever military defeats and saved hundreds of thousands of lives. A year and a half later, the United States entered World War II. The military uneasily eyed the expansive, unprotected coast of Alaska and considered the logistical challenges of outfitting Alaska, still unconnected by road, for the war. The federal government assessed the “floating equipment” that was required to patrol Alaska’s coast, transport materials for the construction of military installations across the Territory, and transport troops to crew the newly-established posts. The military did not have the vessels required for the task. Similar to the nation’s British allies, the federal government turned to the private fleet to fill war-time transportation needs. Military themes were adopted on salmon can labels. Courtesy Karen Hofstad. Some vessels the military bought outright, while others were leased. At the time, most fishing activities centered around the salmon season, so canneries were able to earn money leasing equipment that otherwise laid idle during the rest of the year. Private fishermen, too, leased their vessels. John Molver of Petersburg made an agreement with the Assistant Secretary of Small Boat Procurement to lease his 61-foot packer/longliner Excel for $3000. The Navy painted her gray, placed a 30 caliber machine gun on her bow and a 20 millimeter anti-aircraft gun on her stern, and renamed her P-18 for the duration of her wartime service. Robinson Fisheries and Pacific Coast Codfish Company both had their fleets of codfish schooners requisitioned. Only one schooner continued to fish during the war, the rest of the vessels being converted into barges. The Sophie Christensen, for example, was towed to the Aleutian Islands and used to transport materials to the far-flung military outposts out west, plying the same waters that she usually sailed to fish for cod. In many cases fishermen’s knowledge and aptitude were put to service in the military. As Pacific Fisherman opined, “Fishermen are hardy and handy, and equipped with particular skills which are in primary demand in a nation at war.” Take fisherman Oliver Hofstad of Petersburg, who joined the Navy and was sent back to Alaska to captain the Excel, navigating in waters with which he was familiar. The seafood industry provided other essential services to the federal government during World War II, like supplying food for the war effort. But surrendering vessels typically employed in catching, processing, and delivering fish in order to advance the Alaskan war effort certainly merits mention. Alaska was a tumultuous place during the first two years of World War II. The Territory, like the rest of the nation, was caught off guard by the attacks at Pearl Harbor and the subsequent capture of Kiska and Attu. Following these attacks, there was both a scrambling and influx of people as the military embarked on the Aleutian Campaign. Alaska’s Japanese residents were sent to concentration camps down south, Unangan villagers were taken via transit ships to decaying canneries in Southeast Alaska, 150,000 troops passed through the territory, and the ground was broken on 300 or so military installations, all within those first two years. War affected remote regions across the state, including Excursion Inlet, which is on the north shore of Icy Strait in northern Southeast Alaska. One of the military installations constructed during the Aleutian Campaign was a top secret shipment facility built right next to the cannery in Excursion Inlet. The so-called Alaska Barge Terminal was meant to ease wartime transportation issues. At the beginning of the war, there were not enough large barges or vessels to properly outfit the military installations on the Aleutian front. With the Alaska Barge Terminal, the military intended to use smaller watercraft to ship materials and people up the Inside Passage to Excursion Inlet. At the terminal, the materials would be loaded on oceangoing barges and then shipped across the Gulf of Alaska. The military selected the land adjacent to the Astoria and Puget Sound Packing Co. cannery as the site of the trans-shipment port. This cannery, now owned by Ocean Beauty and referred to by the initials XIP, was constructed in 1908, just up the bay from another cannery that was built that very year. The Excursion Inlet cannery during the summer of 2017. The military commandeered a portion of the cannery’s property and started filling the tidelands in August of 1942. Over 2700 civilian contractors joined over 800 Army personnel to construct the massive facility. When it was finished, the barge terminal included housing and mess hall facilities to accommodate 260 officers and 4,400 enlisted men. A 3.4 million gallon tank farm was installed, which was intended to fuel nine ocean-going vessels, six barges, two ammunition ships, and two tankers. The supposed top-secret facility was not much of a secret to the fishermen and cannery workers who labored next door. The seafood industry, too, was mightily impacted by the wartime scramble. There was a shortage of shipping capacity, “floating equipment” (aka vessels), and workers during the war. The most valuable employees were granted a draft deferment, but military matters took precedence over the shipping of people, equipment and fish to and from Alaska. Hundreds of private fishing and processing vessels were requisitioned for the war effort, and this sometimes included the captain and crew. It was an ongoing struggle to procure the materials, people, and transportation required to fish and process Alaskan salmon. Canned salmon was considered an essential item for feeding servicemen overseas and Americans on rations. In order to fish and process salmon within an active war zone, the federal government instituted a so-called Concentration Plan. With this plan, the Secretary of the Interior determined how many canning lines could be in operation in any given fishing district. “Nucleus” plants were to process the salmon for a fishing area, sharing fishing effort, shipping capacity, and employees with the neighboring plants that were put out of commission. The Concentration Plan produced the salmon pack using the least amount of employees and transportation-related resources. In Excursion Inlet, the Astoria and Puget Sound Packing Co. jointly packed their fish with the neighboring Pacific American Fisheries Plant. In the fall of 1943, after the cannery had shipped its pack south, the frenetic energy of the trans-shipment port too had gone quiet. The US had retaken Kiska and Attu, rendering this multi-million dollar facility obsolete. It was never used; the War Department declared the 630 acre site as surplus. In June of 1944, 700 German prisoners of war arrived at Excursion Inlet, sent to salvage the buildings and materials used for the boondoggle. In the few months they spent at the facility, they were able to salvage about twelve million board feet of lumber. Several POWs reportedly tried to escape, but soon realized that there was nowhere to go. Excursion Inlet plant manager Tom Marshall stands within the museum that he developed on site. The sign next to him shows the cannery's owners over the years. Tom Marshall, Excursion Inlet plant manager, created a small museum at the cannery. Within, visitors can find plats of the barge terminal, photos of the POWs, and other relics from the cannery’s past. Charlie Wright, Sr. relates the story of when the first fish wheel was constructed on the bend of the Yukon River where the village of Rampart rests, deep in Alaska’s Interior. Wright’s great grandfather, Al “Cap” Mayo, carried the spruce poles and other materials down to the shore and started assembling the contraption while villagers laughed at him. They wondered, how could that device possibly catch salmon better than the fish fences and traps that they used, or the nets that they wove from whatever materials they could gather? But once Mayo’s fish wheel started scooping salmon from the mighty river, the Koyukon Athabaskan villagers were quickly convinced of the gear’s efficiency. The Rampart region of the Yukon River became fish wheel country. Cap Mayo might have been accustomed to making people laugh well before making that first fish wheel in the area, having spent his youth as a circus performer before heading to the North. Mayo travelled through Canada, entering Alaska territory via the Yukon River. Beginning in the 1880s, Mayo and his partners Jack McQuesten (of Yukon Jack fame) and Arthur Harper worked as fur traders, store operators, and prospectors from Tanana in Alaska’s interior to Fort Selkirk in Yukon Territory. All three men married Koyukon women. Mayo ran the trading post at Tanana beginning in 1894, with his wife Margaret (Neehunilthnoh). Mayo, who is the namesake of the village in Yukon Territory, died in 1924, well after fish wheels had become a part of life in the Rampart region. Mayo’s great grandson Wright recalls how the sound of the fish wheel permeated his dreams as a child. “On a calm night, the big kings would be banging in the fish wheel box across the river, and they were so large that the sound would wake us up,” he remembers. A man of slight stature couldn’t help but drag the tale of those huge kings on the ground while carrying them, Wright contends, while today Wright can carry three in one hand, like one would carry silver salmon. Every year of his youth, Wright worked with his family to harvest young spruce trees, turn them into poles, and then steam bend the poles to prepare for the construction of new fish wheels. Back then, the village didn’t have the heavy equipment required to pull the wheels from the river at the end of the season, so they often lasted just a year, providing Wright with plenty of construction practice. He remembers fish camps every ten miles along the river, full of families operating fish wheels alongside racks of scarlet-hued dried salmon. Eventually, gillnets began to replace fish wheels as the gear of choice, and knowledge of fish wheel construction began to wane. Moreover, chinook returns became such that even subsistence fishing in the region is curtailed. Prompted both by poor chinook returns, obligations to the Pacific Salmon Treaty and Yukon River Salmon Agreement, and a desire to pass the tradition of fish wheels on to the next generation, Wright is partnering with others to resuscitate fish wheels while modifying them to fit new needs. One of Wright's fish wheels, under construction. Photo courtesy Charlie Wright. Wright creates “fish friendly” fish wheels, utilizing soft mesh for the baskets and adding padding to the chute. The salmon travel down this chute to reach a box from which the fish are plucked. The kind of fish wheel that Wright builds doesn’t injure salmon to the extent of typically-constructed fish wheels, helping off-limit species (like kings) to return to the water with a greater chance of survival. These modified fish wheels are particularly friendly to Canada-bound fish, Wright contends, since the fish wheels are set along the banks of the river rather than jutting out towards the center, as gillnets do. He explains that the middle of the river is a fish super highway, destined for Canadian spawning grounds, while fish destined for local tributaries cling to the side. Consequently, these fish friendly fish wheels can help Alaska to respect treaty obligations and enhance returns to Canada, hopefully allowing for more fishing opportunities along the Alaska stretch of the Yukon. Wright sees returning to traditional fishing methods along the Yukon as a chance to enhance Chinook returns and ensure cultural survival. This summer, Wright has taught youth to build a fish friendly fish wheel in Stevens Village. “It’s feeding many, many families now,” he reports. He also worked with the Tanana Chief Council’s recent Spirit Camp to teach fish wheel construction to kids at camp. The Tanana Native Council has teamed with Tanana Chief Council to extend camps to other villages with the aim of promoting traditional cultural knowledge. If Wright has his way, the legacy of his great grandfather’s fish wheels will persist, the Rampart region will be fish wheel country again, and chinooks as large as one can imagine will bang in fish boxes, waking up a new generation of fishermen. Note: This article was first published in the August 2017 issue of Pacific Fishing. “But this Treaty is the beginning… Our own Fisheries, now so considerable, were small in the beginning… Small beginnings, therefore, are no discouragement to me,” Senator Charles Sumner, Chair of the Foreign Relations Committee, said to the US Senate on April 8, 1867, speaking of the potential of Alaska’s mostly-unknown fisheries. Just the week before, Secretary of State William Seward negotiated the Treaty of Cession with Russian Ambassador Eduard de Stoeckl. The United States was about to purchase Alaska for $7.2 million, but the treaty required Senate approval. Sumner spoke to the Senate at length about the opportunities available to the United States if the body approved the acquisition of Russian America. Sumner waxed about the otters, the timber, the potential for mines (gold had not been discovered in significant quantities in Alaska), but he ended with fisheries. He detailed the reports of European explorers who caught hundreds of halibut with limited effort, of large Native communities subsisting on salmon through the winter, of the newly pioneered cod grounds off the Aleutian Islands. He envisioned an Alaskan fishing industry that would feed growing domestic markets in California, that would export salted fish to majority Catholic nations in Latin America, and that would provide seafood to nascent Chinese and Japanese markets. He concluded his speech, stating, “…the Fisheries, which, in waters superabundant with animal life beyond any of the globe, seem to promise a new commerce to the country.” The next day, the US Senate ratified the treaty. Alaska and its marine resources became American. The commercial salmon industry started soon after. Entrepreneurs salted fish in barrels at Karluk on Kodiak Island, in Karta Bay on Prince of Wales Island and elsewhere. But it was a Scottish entrepreneur named George Hamilton who claims the glory of founding what would become the first establishment to put out a can of salmon in Alaska. Hamilton started a saltery at Klawock on Prince of Wales Island in 1869. He sold his concern to a California firm called Sisson, Wallace & Co and became a shareholder in the newly established North Pacific Trading & Packing Co. 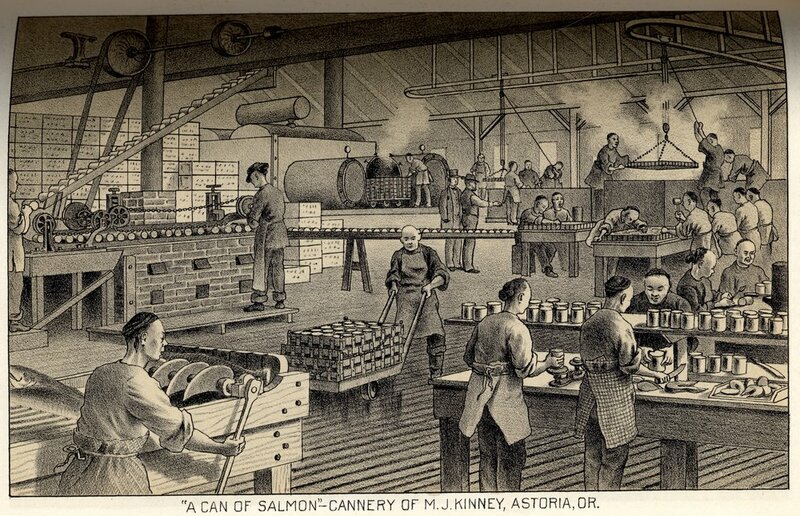 In 1878, the first two canneries were built on Alaska’s shores. The North Pacific Trading and Packing Co. was established at “Hamilton’s Fishery” in Klawock, while the Cutting Packing Co. was built in Sitka. However, the Klawock cannery managed to process the first can of salmon, thus earning the distinction of being remembered as the first cannery in Alaska. Fred Hamilton of Craig, the 96-year old grandson of the founder of Alaska's first cannery. Fred is also the oldest living Haida man. Little is recorded about the early American era of Alaska’s fishing history, and even less about George Hamilton. This summer I traveled to Prince of Wales Island in an attempt to track down new sources and old memories. There I met Fred Hamilton of Craig, Alaska. Fred is the 96 year old grandson of George Hamilton. Fred never met his grandfather, but recalled what he had heard of him. “He was a businessman. He did a lot of travelling. He built a sawmill here, along with a partner. They had a schooner here that delivered lumber.” Fred’s grandmother is a Haida woman named Maggie. Perhaps it is partly due to this family connection that many of the cannery workers at the North Pacific Trading & Packing Co. were Alaska Natives in the early years, when most other establishments relied on Chinese crews. I asked Fred why Klawock was selected as the site for this early cannery. “They always looked for a good supply of water. And Klawock had a good supply. It’s a protected place, with a really good salmon stream there and a lake, with all species of fish except king salmon.” There were ample fishermen, as well; the cannery purchased salmon from local Natives. At the time of the establishment of the Klawock cannery, eleven years had passed since Sumner’s speech and the subsequent Alaska Purchase. Alaska’s commercial salmon industry was tiny, but it was viable. It was Fred Hamilton’s grandparents who took the early steps to convert Charles Sumner’s vision for Alaska into reality.